The Abbey Mill site at Tintern is situated in the heart of the Wye Valley on the banks of the River Wye in the original mill site of Tintern Abbey, founded in 1131. 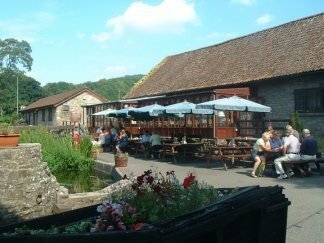 The site includes a friendly Coffee Shop and Cider Barn Restaurant and a variety of shops selling unique items, many associated with the Wye Valley area all housed in the old mill buildings overlooking our trout pond and the River Wye. Wye Valley Centre, Tintern, Monmouthshire, NP16 6SE.